This was the first time I’d done the race so was excited at the prospect of some new running routes. Alarm went off shortly after 3am to give us enough time to get up to Tarbert to register. It was Team Pyllon ‘lite’ and felt like a new adventure rather than turning up to the familiar races and routines. It was a relatively small field but also included a relay option (as well as a half-distance route too) so there were enough bodies at the start. It seems I’ve been jinxed for over a year with races with almost every single one (other than the Fling) having wet / stormy conditions. It was to be no different here – hence the ‘ugly’. It’s not a reference to the route in any way! We all had to stand in the village hall until 1 min before the start as the rain was heavy. I briefly spoke to Scott Bradley on the road before the off. Would have been good to have seen him defend his Highland Fling title this year. Plan was to take it easy early on but keep moving at a decent pace for the whole race. On the long early climb out of Tarbert I tried to run it as easily as possible but within a few minutes I was pretty much on my own with a couple of guys up ahead that were either part of the relay or maybe running a little too quickly. It was nice running somewhere new despite the rain, wind and lack of visibility. The first stage was a mix of grassy / muddy single-track, wide stony forest tracks and plenty of ups and downs. 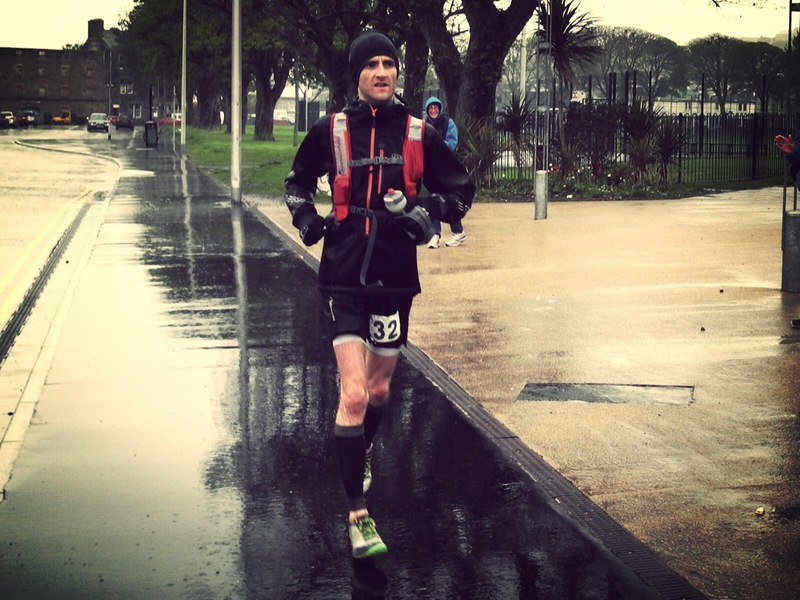 I felt good at the first CP although the weather seemed to be getting worse if that was at all possible. I couldn’t see anyone in front or behind so had to pay attention to the course to ensure I didn’t miss a turn. On a race like this it’s a moment of pure relief when you finally spot a marker after realising that you hadn’t seen one for while. 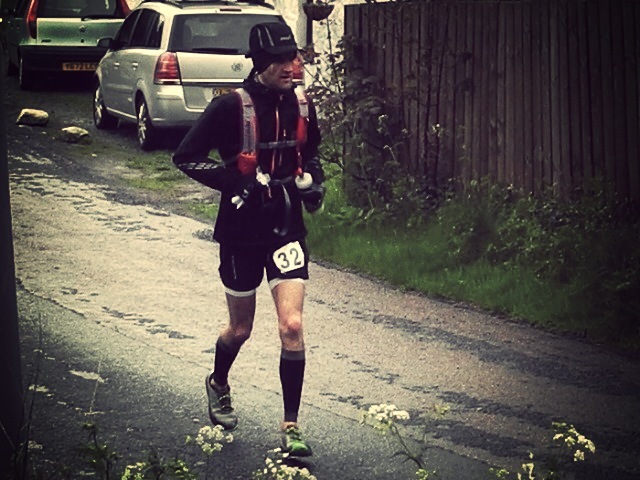 On the next climb the wind and rain was head-on and for a moment I thought I’ll be doing well to finish this race never-mind getting close to the course record. There was no let up by the time I reached Clachan and CP2. I had looked at the next section on a map and knew that there would be some beach running. “Fine” I thought, makes for a nice change. After climbing over some large rocks and a few short spells back on the road I was on to the main beach section. I wasn’t feeling quite so positive now. There was miles and miles of stony beach ahead. Deep rocks and stones. Now I’m not the heaviest of runners (I hear you laugh) and I’m fairly light on my feet but there was just no way for me to run properly along the treacherous rocks and stones. I tried close to the shore but the rocks were too big (and concentrated). I tried further up the beach but the smaller stones were just too deep, soft and energy sapping. My ankles were taking a battering and my lightweight shoes weren’t really helping for once. I just wanted to be off the beach but just couldn’t see the end of it. I swore a lot. I lost a lot of time on this seemingly endless stretch and was happy when I finally reached the next CP (and my folks) who confirmed that it would be mostly hills and trails from now on. At this point it actually stopped raining for a period and threatened to be warm. I was happy to be able to run properly again and pushed on up a long climb instead of toiling an a rocky beach. To my surprise I couldn’t see anyone behind but I knew I’d have to move it if I wanted to pick up time. The sunshine wouldn’t last of course but for a while it was an incredibly nice place to run. The next section took us back onto a beach. They mentioned something about high-tide and rock-climbing but I didn’t really take it in. This time no stony beach – just water right up to the large rocks. The kind as a child you’d spend hours playing on, poking about in rock-pools. Lovely, but not a normal racing terrain for me anyway. After the beach saw a long climb of switchbacks which gave me a chance to see if anyone was following. Couldn’t see anyone by the top and once up, over and on to the descent the rain was back. By Ifferdale and 53 miles the weather was as bad as it was at the start. Just one more section to do though. Sadly it was 14 miles worth and I’d have to get moving. Most of this was now on wide forest tracks and it felt like it was beginning to drag. I sank a few gels and hoped I had enough fluid in my refilled bottle to get me to the end. Fortunately the no.1 crew met me again at the start of the road section with about 7 miles to go. It was going to be reasonably tight to get in under 11.00 hours now with a few tarmac climbs still to come but I was confident I could do it. My Dad told me what was required and I played that on repeat in my head for the last 7 miles. I longed to see Campbeltown and every time I got to the top of a hill or rounded a bend was convinced I’d be there. I argued with myself that there must be something wrong with my Suunto as it said I still had at least 3 miles to go. It’s never been wrong before but I argued anyway. I passed a few more runners in the other race before I finally turned into the town. I had no idea where I was going but I knew the crew wouldn’t let me down, so it was up on the toes and run as hard as I could until I could see a family face. It was a vision in pink seeing my Mum standing in the p*ssing rain pointing down a road. “It’s there – that building”. Head down. Final push. I only stopped when my Dad said “enough Son – you’ve finished.” I stopped. No finish line, just some half-drowned people and a few clip boards. This is Scottish ultra racing. I was pleased to be told that my win had seen me break the course record in 10:38. One that had been held by an ultra-runner who has inspired me over the last few years. (I know you’re not racing any more but you’re still awesome!) All round I had a much better day than my previous race and had learned a lot from the approach to the day. This was exactly the race I was needing before the West Highland Way. Huge thanks to Race Director Rob. It’s a stunning route and for once I didn’t get lost which must have been a combination of luck as well as the route marking and marshals. And to everyone who said ‘well-done’ or clapped – it really does make a difference and is very much appreciated. Mum and Dad – you were brilliant. Was great sharing the whole day with you – what a blast we had (some moments I’ll never forget). Although we could have done without the long drive home. This entry was posted on June 17, 2013 by pyllon. 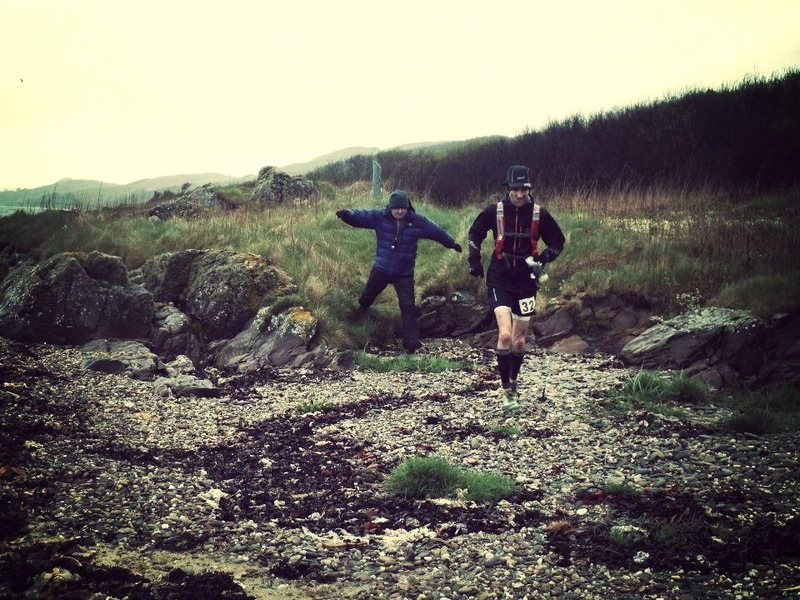 It was filed under 2013, Kintyre Way, Paul Giblin, Race, Results, Ultra, Ultra distance and was tagged with 2013, Clif, Kintyre way, nathan, race, results, running, trail, ultra. Was a fine day in spite of the poor weather. Well done son. Want to go back and walk the Way sometime soon.